Trump Shrinks Bears Ears And Grand Staircase-Escalante National Monuments : The Two-Way In a speech in Utah on Monday, President Trump announced that his administration will shrink the Bears Ears National Monument by roughly 85 percent and the Grand Staircase by about half its size. Broken Bow Arch rises from Willow Canyon in the Escalante Canyons region of Utah's Grand Staircase-Escalante National Monument. 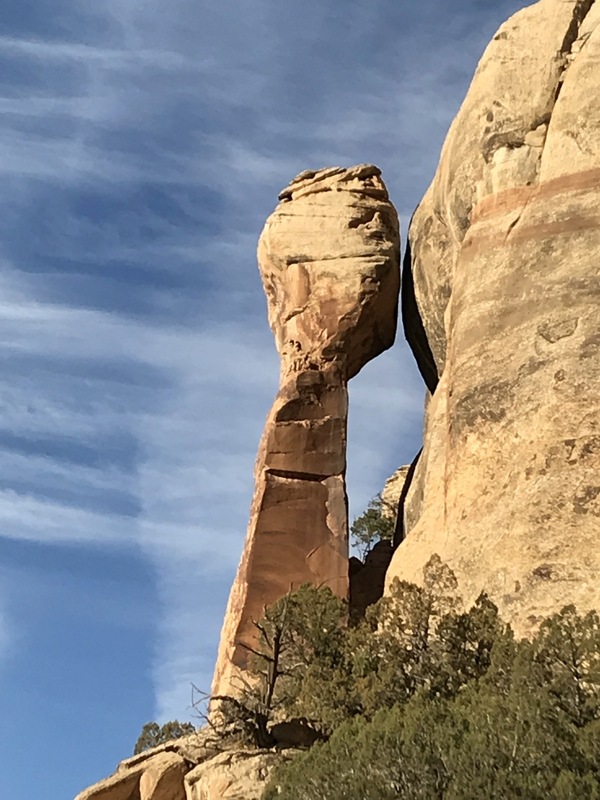 On a visit to Utah on Monday, President Trump announced his proclamations dramatically shrinking the size of the state's two massive national monuments, Bears Ears and Grand Staircase-Escalante. Taken together, Trump's orders mark the largest reversal of national monument protections in U.S. history. The change has already been challenged in court by conservation groups. The Bears Ears National Monument will go from roughly 1.3 million acres to roughly 228,000 — only about 15 percent of its original size. And Grand Staircase will be diminished by roughly half, from its nearly 1.9 million acres to about 1 million. The specific numbers were provided to reporters by Interior Secretary Ryan Zinke prior to Trump's announcement in Salt Lake City. "No one values the splendor of Utah more than you do," Trump told an enthusiastic crowd Monday, "and no one knows better how to use it." He noted that before making the decision, he had discussed it with Zinke and the state's two GOP senators, Orrin Hatch and Mike Lee. Both senators have been outspoken critics of the two national monuments — both protected under the 1906 Antiquities Act by Democratic presidents — framing them as significant federal overreach that deprives Utahans of their own land. And Trump echoed those criticisms Monday. "These abuses of the Antiquities Act give enormous power to faraway bureaucrats at the expense of the people who actually live here, work here and make this place their home," Trump said. His decision caps months of speculation and a controversial review of the boundaries of large national monuments that protect more than 100,000 acres of U.S. public land. The review, conducted by Zinke, originally looked at more than two dozen national monuments designated by presidential decree since the 1990s. Utah, with its new Bears Ears monument and the Grand Staircase National Monument, has always been at the center of the debate and largely what spurred the review. Trump's predecessor, President Barack Obama, created Bears Ears shortly before leaving office, while the Grand Staircase monument dates to the Clinton administration. And depending on which side you're on, Monday's announcement is either about an overreaching federal government that prevented development on large amounts of federal land with little local support or it's the latest example of the U.S. government breaking promises with Native Americans and eroding environmental protections. 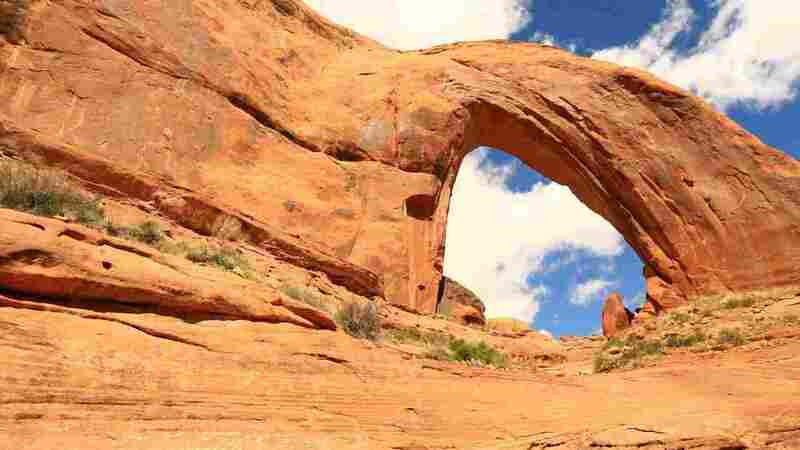 Utah's Republican congressional delegation, along with county commissions and conservative groups, pressed the administration to open up these federal lands once more for private use. "President Trump's decision to reduce these monuments allows us to still protect those areas that need protection, while at the same time keeping the area open and accessible to locals who depend on this land for their daily lives," said Matt Anderson of the Utah-based Sutherland Institute. Anderson says large, public-land national monuments hurt rural counties. These areas already have large amounts of federal public land, he says, where cattle grazing, mining and other types of private enterprise are heavily regulated. Rural Utah is still fuming from President Bill Clinton's designation of the Grand Staircase in 1996, which grandfathered in existing cattle-grazing leases and other uses but also nixed a proposed coal mine. Clinton signed the proclamation at the Grand Canyon, in Arizona, and Utah officials at the time said they were blindsided. "When you designate a large national monument, you restrict access to the land and you block traditional uses of the land," Anderson said. The home of Bears Ears, rural San Juan County, is often cited as one of Utah's poorest, and more than 60 percent of all its land is owned and managed by the federal government. 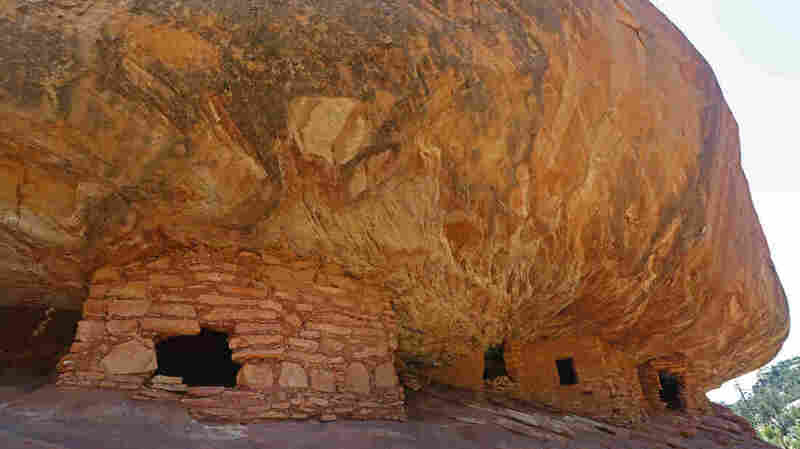 Ancient granaries, part of the House on Fire ruins, are shown here in the South Fork of Mule Canyon in the Bears Ears National Monument outside Blanding, Utah. "A sad day for Indigenous people and for America"
During his speech Monday, Trump said the national monument designations also "prevent Native Americans from having their rightful voice over the sacred land where they practice their most important ancestral and religious traditions." Many tribal leaders and activists are likely to deeply object to this assessment. For months, they have passionately campaigned to preserve the national monument designations — and now, upon hearing Trump's proclamations, they are promising to sue. "The Navajo Nation has made repeated requests to meet with President Trump on this issue. The Bears Ears Monument is of critical importance, not only to the Navajo Nation but to many tribes in the region," Navajo Nation President Russell Begaye said in a written statement. "The decision to reduce the size of the Monument is being made with no tribal consultation," he said. "The Navajo Nation will defend Bears Ears. The reduction in the size of the Monument leaves us no choice but to litigate this decision." "Bears Ears National Monument is not just for Native Americans but for all Americans," Vice President Jonathan Nez said. "This is a sad day for Indigenous people and for America." Bears Ears is considered some of the most culturally significant land in the American Southwest. Its famous Red Rock Canyon country is dense with ancient artifacts, cliff dwellings and sacred burial grounds. Just a couple of years ago, some of the land was proposed for additional federal protections, but a bill backed by Utah's House Republicans stalled in Congress. Then, last year, the Obama administration held meetings in the region before declaring it a national monument in late December under the 1906 Antiquities Act. Tribal leaders took to the streets of Salt Lake City over the weekend to protest the president's decision. At a rally Saturday, Ethel Branch, attorney general of the Navajo Nation, predicted the president wouldn't even set foot on or see the land in question. "I want him to visit Bears Ears before he takes any action," Branch told a cheering crowd at a rally outside the Utah Capitol. But Trump did not visit Bears Ears. The monument is more than a five-hour drive from Salt Lake City, and the president's tight schedule, which included a trip to the Church of Jesus Christ of Latter-day Saints' Welfare Square, brought him home to the White House by the end of the day. A pinnacle leaning into the sky in the Bears Ears National Monument in Utah. The Navajo Nation isn't the only group to announce its intention to sue the Trump administration over his proclamations. Conservationists have also voiced their objections — and their plans to bring those objections to court. By late Monday, 10 conservation groups had filed a lawsuit, alleging that Trump's action was "unlawful" and an abuse of his authority. The suit argues that the law "authorizes Presidents to create a national monument; it does not authorize Presidents to abolish them either in whole or in part, as President Trump's action attempts to do." "I think the only thing this administration understands is lawsuits," Yvon Chouinard, founder and CEO of outdoor gear company Patagonia, told CNN. "We're losing this planet, and we have an evil government. And not just the federal government, but wacko politicians out of Utah and places. I mean, it's evil. And I'm not going to stand back and just let evil win." The company is not a party in the conservationists' lawsuit. Republicans in Congress have proposed changes to the Antiquities Act, which was originally intended to protect against the looting of ancient artifacts from public land, to make it harder for presidents to use it as a means to create large national monuments. The law, as written, authorizes the president to designate these monuments — but it is gray on the matter of whether a president can actually shrink or abolish a large, already-existing monument. Sixteen presidents have used the Antiquities Act to create public-lands monuments, but legal experts say that the task of modifying public lands has historically been the role of Congress. "President Trump's dramatic reduction of the Bears Ears National Monument is a direct attack on the Antiquities Act and America's public lands. We intend to challenge this action in federal court," Stephanie Meeks, president and CEO of the National Trust for Historic Preservation, said in a statement Monday after the announcement. "Rolling back the designation of Bears Ears leaves thousands of extraordinary archaeological sites vulnerable to looting and vandalism. The President's action also opens the remarkable Bears Ears' landscape to incompatible oil and gas development." she said. "This arbitrary review and illegal action will not go unchallenged," said Nicole Croft, executive director of Grand Staircase Escalante Partners. Environmentalists like Croft fear the decision could set a precedent for future presidents to unravel protections on federal land. "The experience of exploration, wonder and humility at the grandeur of the natural world is one our children and their children deserve, and that is what this administration is trying to rob from our future," she said. A previous version of this story said President Trump planned to visit the Mormon Temple. He was scheduled to tour the Church of Jesus Christ of Latter-day Saints' Welfare Square.